In today's world of stop and go, everybody needs a soothing hand to kneed away stress and fatigue during driving especially on a bad day. 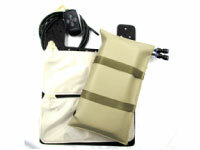 Latest technology which uses air pressure to provide support and massage to our back and waist (lumbar). In our concept, this is simulated by inflating or deflating of air bladders integrated into all sorts of vehicle seats. The concept is popular among world leading luxury car manufacturers typically BMW, Jaguar, Mercedes, Land Rover, etc by using conventional mechanized system. The system massages sore spots in a moderate and mild manner to create movement and stimulation in the soft tissues and in the lumbar spine to improve blood flow to the supporting muscles and nutrient movement within the discs. There were 4 integrated air bladders to massage back & waist (lumbar) of the driver and/or the passengers. Up to 3 massage programs to choose from for best level of comfort and individual preference.